NDP pension critic Scott Duvall announces his Bill to protect pensioners as NDP leader Jagmeet Singh (left) and other supporters look on. 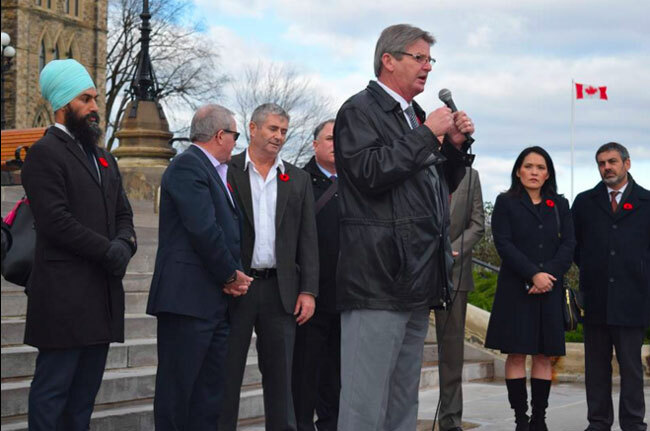 New Democrat Scott Duvall (Hamilton Mountain) has introduced a Private Member’s Bill in the House of Commons that would give workers higher payment priority when their company goes bankrupt. “I rise today to introduce a private member’s bill titled, an act to amend the Bankruptcy and Insolvency Act and the Companies’ Creditors Arrangement Act. This bill will amend the Bankruptcy and Insolvency Act and the CCAA so that companies will have to bring any pension plan fund to 100% before paying any other secured creditors. It also makes amendments to require companies to pay any termination or severance pay owing before paying any secured creditors. “Other amendments will prevent a company from stopping the payment of any post-retirement benefits during any proceedings under the BIA or CCAA. These amendments will inject some fairness into a process that often sees the interests of workers, retirees, and their families placed behind all others.